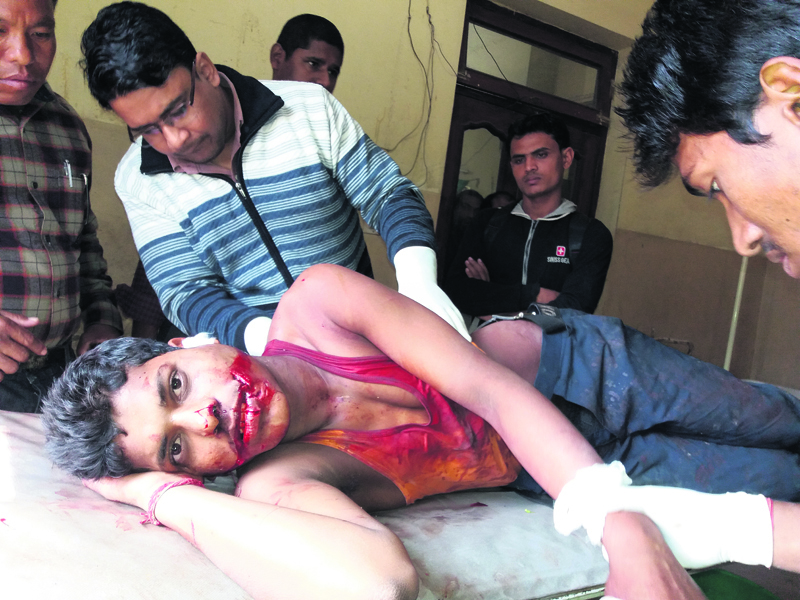 Motilal Yadav, 20, was among those injured in the tiger attack. BIRGUNJ, Feb 8: A tiger which had strayed into a village in Parsa on Tuesday morning was shot dead by the security personnel late in the afternoon following a four-hour battle to control the beast. The tiger injured 10 people, including some policemen, despite being hit by a bullet. It succumbed to the injuries later. The tiger was seen roaming around a field nearby a pond at Lakhanpur VDC at around 11 in the morning. The villagers spread words about the tiger and immediately informed the police. Upon hearing the news, a lot of villagers gathered to see the tiger. Frightened by the crowd, the tiger began to attack the villagers. The tiger resorted to attack after the villagers tried to shoo it away. Initially, the tiger had injured just three people when the police fired at it. However, the rifle of the police failed to fire additional shots that only infuriated the animal, triggering more attack. By the time the tiger passed out at 3 pm, it had injured 10 people. Four of the critically injured people were airlifted to the capital for treatment. “When the villagers heard about the tiger, they all flocked to see the wild cat instigating attack from the frightened animal,” said Upendra Prasad Yadav, who survived the attack by a whisker. “At first, it attacked two young guys. The condition of one of them is critical,” he added. “I was working in a field and when I heard about the tiger. I immediately rushed to the nearby village to hide myself but got attacked on the way,” said Mahendra Sahani of Ramnagari. His right hand and left leg have been injured in the attack. It has been speculated that tiger might have entered the village either from Chitwan National Park or from Parsa Wildlife Reserve. According to the police, the tiger was about 4 feet tall. “We didn’t want the villagers to be the prey of the tiger so we went carrying a rifle,” said Inspector Chakra Bahadur Shah, who was also injured in the incident. “We deployed three different teams to take the tiger under control but unfortunately we were still not able to tame the beast. So, we were forced to shoot it as the last resort,” said DSP Govinda Shah of a Parsa-based police office. According to the locals, there were about 100 security personnel deployed to bring the tiger under control.